How A Bone Disease Grew To Fit The Prescription In 1990 the bone condition called osteopenia — slight thinning of the bones — didn't exist. Today all over America women are diagnosed with osteopenia and given medication. This is the story of how a drug company's marketing efforts changed the definition of a disease and created a new category of people who saw themselves as needing treatment. Katie Benghauser was diagnosed with osteopenia and takes Fosamax. Katie Benghauser had no concept of all the forces that combined to bring the box of pills to the bottom shelf of her medicine cabinet. All she knew was that three years ago she went in for a routine checkup and her doctor told her it was time for her to take a test. Not that there was anything in particular about Benghauser that suggested sickness. At 54 she exercised every day and could outrun most 20-year-olds. She was a model of health. Still, because Benghauser was thin, white, female, in her 50s and had a sister who had some bone problems, she says the doctor told her that she was concerned. "She felt like because my frame is slight and I'm female, that I was at risk for developing osteoporosis." Osteoporosis is a disease that causes bones to become thinner, more porous and break more easily. It mostly affects elderly women, who can be devastated by a fall that breaks their hip. One in five elderly women who break a hip will die within a year. Still, just to make sure, Benghauser went in for a test that measured the density of her bones. Two weeks later a letter came in the mail with an unsettling message: Benghauser had a condition called osteopenia, and her doctor recommended medication. Osteopenia is different from osteoporosis. In fact, though Benghauser is extremely health conscious, she wasn't familiar with it. "I'd heard of osteoporosis before, but I'd never heard of osteopenia," she says. Osteopenia, it turns out, is a slight thinning of the bones that occurs naturally as women get older and typically doesn't result in disabling bone breaks. Still, Benghauser's doctor recommended that she go on treatment. As Benghauser asked around, it turned out that many of her peers were taking the pills. For example, she works in an office in Richmond, Va., with seven other women. "Half the staff is younger, in their 20s and 30s, and then there are four of us that are over 50," she said. "Three of those four are on some kind of medication for osteopenia." This is the story of how pills for osteopenia ended up in Benghauser's medicine cabinet, and in the medicine cabinets of millions of women like her all over the United States. But more broadly, it's the story of how the definition of what constitutes a disease evolves, and the role that drug companies can play in that evolution. Osteopenia is a condition that only recently started to be thought of as a problem that required treatment. Until the early 1990s, only a handful of people had even heard the word. 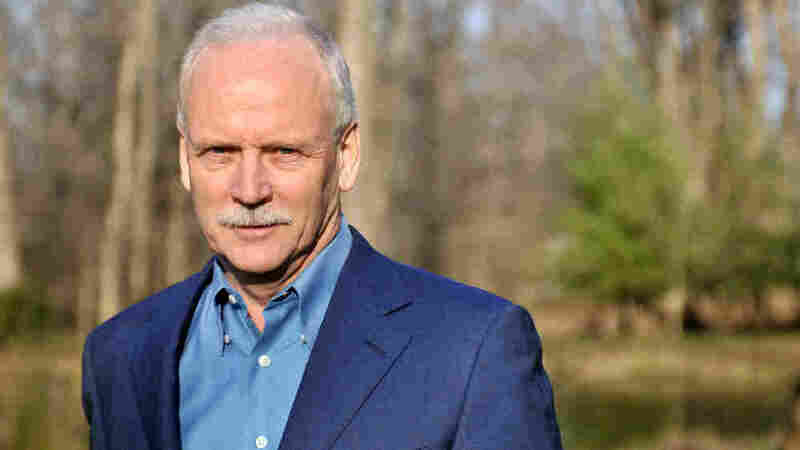 And to understand how osteopenia was transformed from a rarely heard word into a problem that millions of women swallow pills to treat, you need to go back to the beginning, to a place very far away from Benghauser's suburban Virginia home. The meeting took place in Rome, in a small hotel at the top of the Spanish Steps. There in 1992, a group of osteoporosis experts gathered under the auspices of the World Health Organization. The meeting had been organized because professional opinion about how to diagnose and measure osteoporosis was all over the map. Doctors and researchers didn't even have a shared view of how osteoporosis should be defined. For a long time doctors and researchers were only able to diagnose osteoporosis after a woman experienced a bone fracture. But by the early '90s technology had evolved, and bone scanners made it possible to determine whether the bones were weak before any fractures occurred. Anna Tosteson is a professor of medicine at the Dartmouth Institute for Health Policy and Clinical Practice and Dartmouth Medical School who attended the meeting. 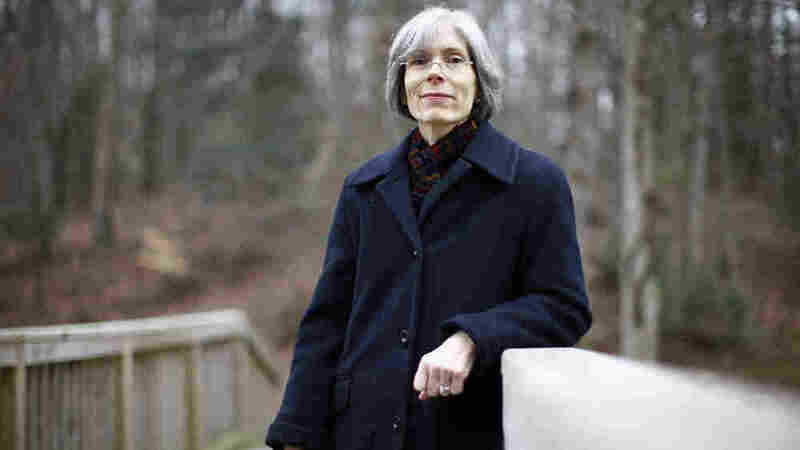 She says that over a two- or three-day period the experts in the room went back and forth and back and forth, looking at research and trying to decide precisely where on a graph of diminishing bone density to draw a line. "Ultimately it was just a matter of, 'Well ... it has to be drawn somewhere,' " Tosteson says. "And as I recall, it was very hot in the meeting room, and people were in shirt sleeves and, you know, it was time to kind of move on, if you will. And, I can't quite frankly remember who it was who stood up and drew the picture and said, 'Well, let's just do this.' "
"I used to run marathons, and I would fall and trip on broken sidewalks," she told me. "And you know initially before I had this diagnosis I didn't think anything of it. But now every time I fall I get up and think, 'Oh, good, I haven't broken anything.' "
"I'm much more aware of making sure I lift my feet up and I don't trip on the sidewalks, but you know, if I didn't know that I had osteopenia, maybe I wouldn't be so cautious." The answer to that question starts with a man named Jeremy Allen, who lives in a sprawling home in Pennsylvania. Allen was born in the United Kingdom and came to the United States in 1982, a young man with energy to spare, looking to make a name for himself in the pharmaceutical industry. After working briefly for the drug company Smith, Kline and French, Allen eventually ended up running North American operations for a massive pharmaceutical research company called IMS Health. He retired from that company in 1991 and set up a consulting business. Then in 1995, Allen was approached by the drug company Merck. The pharmaceutical giant had just released a new drug called Fosamax, which, Allen says, represented a sea change in osteoporosis treatment. "Fosamax was the first [nonhormonal] drug that could credibly make a claim to stop the progress of osteoporosis," he says. Until drugs like Fosamax began to emerge, the standard treatments were calcium, vitamin D, weight-bearing exercise and hormonal treatments, though ultimately hormonal treatments proved problematic. Since osteoporosis is a serious problem that affects millions of women, the potential market for Fosamax was enormous. Fosamax could become a blockbuster drug, one that made over $1 billion a year. The problem, Allen says, was that after its release, "Merck wasn't selling its drug." Allen had known the president of Merck America, a man named David Anstice, for years; they'd worked together at IMS Health. Allen says Anstice came to him with a proposition: Figure out this problem and then fix it. "My job description read: 'Provide some out of the box thinking,' " Allen said. So Allen set to work. He talked to researchers, doctors, and soon the issue with Fosamax sales became clear: To get large numbers of women on Fosamax, large numbers of women needed to get their bones scanned and be diagnosed with osteoporosis. But in America in 1995, there was simply no way to do that. Allen says the machines that actually measured bone density were exceedingly rare. "The only diagnostic procedure was an expensive machine called a tabletop bone densitometer that was costing the patient between $200, $250, $300 per test," Allen says. "And there were only a couple hundred testing centers in the United States, which meant that almost everybody had a day's ride, or had to go from the suburbs to downtown to get the test. It was expensive and it was inaccessible, so lo and behold nobody did it." To sell Fosamax, then, Merck and Allen needed to do two things: place machines that could measure bone density in doctors' offices all across America and bring down the price of the tests. But Allen says for him this wasn't just a matter of selling drugs; he considered osteoporosis a public health crisis. He points out that 1 in 5 elderly women with a hip fracture dies within a year. "Clearly that's not very good," he says. And so armed with the firm conviction that he was about to do good in the world, and coincidentally sell a ton of drugs for Merck, Allen set out to completely rework the way the American health care system measured bone. To do this, Allen figured, the first thing he needed was an institution, an entity whose mission was not just to sell drugs, but to serve the public good. So he decided to create one. In 1995 he persuaded Merck to establish a nonprofit called the Bone Measurement Institute. On its board were six of the most respected osteoporosis researchers in the country. But the institute itself had a rather slim staff: Allen was the only employee. "There was no payroll, there was no building, there was no office with the name 'Bone Measurement Institute,' " Allen says. Essentially Allen's desk at Merck was the only physical space the Bone Measurement Institute actually inhabited. "I was it," he says. Once the Bone Measurement Institute was established, Allen set out to determine if there was some alternative to the standard way that bone measurement in America was practiced. Again, in 1995, the usual way to measure bone was to have a women lie on top of a huge, and hugely expensive, table-sized machine that provided detailed images of hip and spine. The machines were effective but because of their high price, the average doctor would never be able to afford them. Allen needed smaller, cheaper options, and soon he found them. "I figured out you could use what were called peripheral machines," Allen says. Peripheral machines were small, often portable units that measured bone density in the forearm, heel, wrist or finger rather than the hip and spine. At the time, few bone measurement companies manufactured the machines, because they didn't measure the hip and spine. Still, from Allen's perspective, they were the perfect solution: They wouldn't take up much office space and they cost only a fraction of the big machines, which meant that doctors would be able to afford them. And so Allen started a campaign to ensure that peripherals were both manufactured and promoted. "We went very strongly to the six or seven manufacturers who were either in this business or wanted to get into this business and said, 'We will fund your development of these other machines.' "
But, according to Allen, several of the machine manufacturers were less than enthusiastic. In fact, Allen says, two of the dominant players were downright hostile. "Because it wasn't as profitable," he says. "I was a threat to their business model. Their business model was to sell just a few machines at a very, very high price. And I wanted them to sell a lot of machines at a much lower price." But Richard Mazess, founder of the Lunar Corp., one of the largest manufacturers of bone density machines, has a very different view of Allen's attempt to promote peripherals. Mazess says Lunar's resistance to embracing the peripheral machines had nothing to do with money or business models. Lunar opposed peripherals, he says, on the merits. "It was diametrically opposed to what the academics thought was best for diagnosis," Mazess argues, "and would just lead to bad medicine." The problem with the smaller peripheral machines, according to Mazess, is that taking a measurement of someone's heel or forearm isn't going to tell you what you need to know about the bones in the parts of the body that, if fractured, increase a woman's risk of death — the hip and spine. "We were not about to go ahead and tell physicians to use inadequate diagnostic equipment simply because Merck wanted that," Mazess says. And Mazess says because Lunar refused to cooperate, his company was threatened. He says Merck told him, " 'You're not going to get support from Merck. And we will support your competitors, and we will tell people working with Merck not to use Lunar machines.' "
"Basically they were going to make sure that we paid the price," Mazess says. Lunar wasn't the only company put on notice that Merck was serious about investing in the smaller peripheral machines to drive down the price of bone density exams. Allen says that to encourage companies to take Merck's goals seriously, Merck itself purchased a bone measurement business. "We bought one of the companies, and showed how low the price could become, purely to get everyone's attention. And we got everyone's attention," Allen says. "And subsequently when everyone else moved, we let it go and the company closed. We cheered its demise." Paul Strain is a lawyer who represents Merck's corporate office. Though Strain wasn't able to comment on many of the particulars of Allen's story, he did confirm the broad outline: Merck set up a nonprofit called the Bone Measurement Institute, which worked to spread the number of machines and bring down the price of bone exams. But from Merck's perspective, helping to foster and develop diagnostic tests is simply part of the process of putting out many drugs. Strain was quick to point out that doing something about the lack of machines was important because Fosamax was a drug with genuine lifesaving potential. "Merck had an effective medicine, the first effective nonhormonal medicine for dealing with osteoporosis. And naturally physicians were interested in that," Strain says. "But there were significant barriers to doctors' getting these machines because they were very expensive." Strain rejects the idea that the peripheral machines were inferior, that a scan of the wrist or forearm doesn't provide good information about the risk of hip and spine fracture. "There's a clear correlation, and there are many, many studies that have shown that," Strain says. But others disagree. Sanford Baim, a former president of the International Society for Clinical Densitometry, argues that peripheral machines should only rarely be used to diagnose osteoporosis. During menopause bone is lost at different rates at different sites on the skeleton, so the way to best predict hip and spine fracture, Baim says, is to measure the hip and spine directly. "The risks of spine and hip fracture are more reliably estimated by the central [big] machines, rather than the peripheral [smaller] devices," agrees Donald Bachman, a radiologist at the Metrowest Medical Center in Natick, Mass. Nevertheless, Merck did work hard to get the smaller machines into doctors' offices. Allen says Merck helped get peripherals through the FDA process by funding trials and assisting with submissions. He says doctors were educated about the availability of these new inexpensive machines and pamphlets from each company were sent out with the Fosamax sales force. Merck also created a leasing program so that doctors could finance the purchase of a machine, large or small. Merck's work to restructure the market didn't stop there. Merck worked to change the very economics of measuring bone by getting bone scans reimbursed by Medicare. Allen actually left the Bone Measurement Institute before much of this work took place, but in 1997 the institute and several other interested organizations successfully lobbied to pass the Bone Mass Measurement Act, a piece of legislation that changed Medicare reimbursement rules to cover bone scans. Several of those other organizations that lobbied for the bill also got funding from Merck. It is impossible to overemphasize just how important this legislation was, says Steve Cummings, the director of clinical research at the California Pacific Medical Center Research Institute. Cummings has done bone research and followed these issues for years. "Up to that point patients needed to pay for bone densitometry out of their own pocket, but once it's reimbursed [then] clinicians can be reimbursed if they buy the machines. [Clinicians] can be reimbursed if they license the machines. They get paid for making measurements of bone density." Thus in the late '90s and into the early 2000s, Cummings says, measuring bone density became a profitable thing to do. And something else critical to this story happened in 1997. Cummings points out that that was also the year Merck got clearance from the FDA for a new version of its drug. "Merck developed a dose of Fosamax, a 5-milligram — a lower dose that was intended for use by women with osteopenia," Cummings says. Women like Katie Benghauser. Cummings says to understand how so many women today are treated for osteopenia, look more closely at all the machines — both large and small — that Merck helped place in doctors' offices. "I think the critical event in turning ostoepenia into a condition that people believe needs treatment is the report that comes from the bone density machines," Cummings says. See the full bone scan report. Most of the machines that ended up in doctors' offices in the wake of the 1997 legislation would scan the bone and then spit out a report with three distinct colors: green, yellow and red. Green meant normal. Red meant osteoporosis. Yellow meant osteopenia. 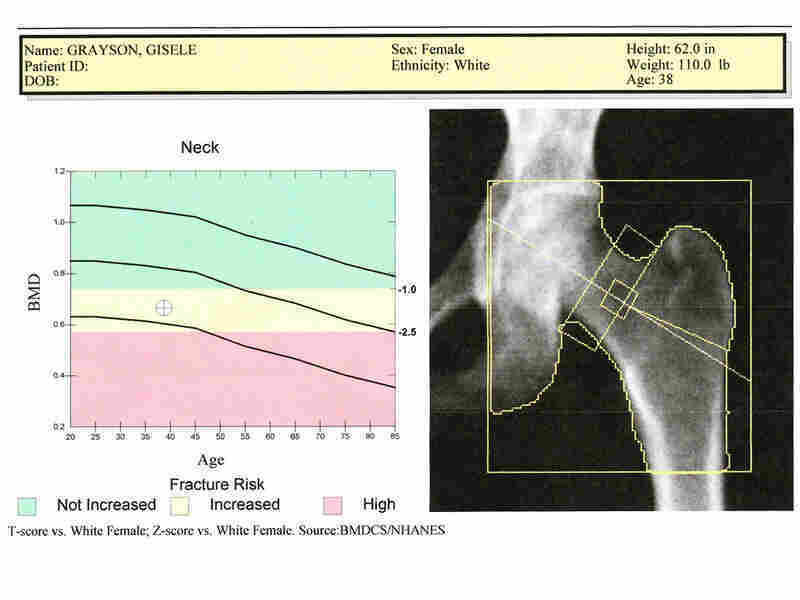 The very existence of the word "osteopenia" on a medical report, along with the clear green-yellow-red graph, had a profound effect, says Cummings. "When millions of women are getting the word 'osteopenia' from the bone density test that they are getting in their 50s and 60s, they get worried," Cummings says. "When a clinician sees the word 'osteopenia' on a report, they think that it's a disease. They want to know: What should I do?" Additionally, Merck, and eventually other companies, run commercials advertising drugs to prevent osteoporosis. Those commercials don't feature humped grannies but young-looking women. And Cummings says at a certain stage it simply reaches a tipping point. "Bone densitometry becomes increasingly available. And women start wanting it, and they hear their friends have had a measurement of bone density, and their friend was told that they have osteopenia, and they want to know if they have that condition. And then their friend starts getting treated with Fosamax or some other drug, and they want to know if they should be treated," Cummings trails off. "It's almost viral." In fact, Medicare claims for screening exams increased from 77,000 in 1994 to more than 1.5 million annually by 1999. The sale of peripheral machines went up more than 500 percent over the same period of time. And through this process of testing and advertising eventually a cultural consensus took hold. Osteopenia simply became a condition that was seriously considered for treatment. A diagnosis was born. Now for many people, particularly Allen, what's described above is all for the good. No one has lost. Everyone has won. "Fosamax became a successful drug. [Other drugs] that subsequently have been developed have been successful, and there are a lot less women dying of hip fractures or stooped over than there were a generation ago," Allen says. There is a scientific consensus that it's beneficial to give Fosamax to women with osteoporosis, especially older women and any woman who has already had a fracture. And Strain, the lawyer from Merck, argues that Fosamax also is good for women with osteopenia. He says Fosamax and drugs like it build bones and therefore prevent fractures in women with osteopenia. "It's well established that there is a clear correlation between bone mineral density and fracture risk," Strain says. "And by preserving and maintaining bone mineral density Fosamax lowers the risk of fracture." But, increasingly, bone scientists like Cummings say Fosamax — and drugs like it — are not a necessarily a win for most women with osteopenia. Studies in women with osteopenia show that while Fosamax and similar drugs reduce spinal fractures, the drugs may not reduce other types of bone fractures that are more common in women who have osteopenia, say Cummings and Susan Ott, an associate professor in the department of medicine at the University of Washington. "There was no difference in the number of [nonspine] fractures you had, whether you took the medicine or a placebo," says Ott. "It does make your bone density go up higher, but the number of fractures is what really matters, and that didn't really change"
There are no long-term studies that look at what happens to women with osteopenia who start Fosamax in their 50s and continue treatment long-term in the hopes of preventing old-age fractures. And none are planned. So Cummings says treatment should start only when fracture risk is significant, bone density is low, or someone already has a spine fracture. He says the WHO is promoting a new tool called the FRAX, which looks at a variety of factors that influence the risk of fracture. This allows women and their physicians to more accurately estimate their risk of experiencing a disabling bone break. Ott agrees. And, she also worries that taking these medications long-term — over 10 years or more — might actually make bones brittle. Ott points to a very small number of case reports about spontaneous breaks in the upper leg, which — though very rare — could be important, she says, given what's at stake. "Instead of preventing fractures you might get fractures," she says. "But it doesn't happen right away. It certainly doesn't happen in the first five years [of treatment]." There's still controversy among specialists about when women with osteopenia should get this medication. But what is clear now is that getting that box of pills into Banghauser's medicine cabinet wasn't a simple matter. Allen says it took a huge amount of work. Work he loved. "I get a great sense of satisfaction that I was able to rejigger the marketplace so that women could be treated for osteoporosis before it got them," Allen says. "That was a good episode of my life." From Allen's perspective, by making a treatment for osteoporosis widely available, he helped save millions of lives. But Mazess, from the Lunar Corp., doesn't see it that way. "He was complicit in a plot to misdiagnose American women," Mazess says of Allen. From Mazess' perspective, millions of women with osteopenia are now needlessly exposed to the risks of a medication that may not ultimately help them. The paradox of our health care system is that both of these men are probably right. That is, drug companies produce incredible drugs that can greatly relieve suffering. But one way they profit from those drugs is to extend their use to as many people as possible, which frequently means that medications are used in populations with milder and milder versions of a disease, so that the risks of medicating can come to outweigh the benefits. "There's a powerful economic incentive for pharmaceutical firms to expand the boundaries of the use of different therapies. So whether you consider treatments for osteoporosis or treatments for depression or treatments for high cholesterol — in all of these settings — pharmaceutical firms stand to benefit if the therapies for these diseases are broadly used," Alexander says. "Even if they're used among people who have very mild forms of these diseases." So tonight before bed open your medicine cabinet. There you will see a shelf of pillboxes, many with complicated biographies. The radio story was produced by Gisele Grayson.